As I write this, there is a month to go until my self-imposed 35:35 Challenge deadline and it’s looking as though I might not complete it, as I have eight challenges left, and not many ideas booked in, or much money to spend on it! I’ve been thinking quite a lot about this recently, because although the Challenge is meaningless to everyone else, it has structured the whole of last year for me. It has made me say ‘yes’ to things where previously I might have said ‘no’. It’s made me braver, as I often find myself in places on my own and a bit out of my depth. It’s led me to new places, to new situations and to lots of new people. I am hopeful that a handful of those people might even become real friends. So, in short, it’s changed my life. So, it shouldn’t matter if I don’t get to 35 things. The changes that have taken place within me will continue once my birthday is over. I’m still more likely to say yes than I ever was and be brave about trying things even if that means I have to sit at a table on my own, too scared to approach other people before being feeble and running away (which has happened). It doesn’t matter usually because once I learnt to accept who I was and what my personality is like (which took a long time and used up a lot of tears) I realised that I don’t have to finish things. Very often, once I have learnt what I want to learn about a subject, I’ll happily move on. Sometimes I return to that subject at a later date, sometimes it’s a one-time-only affair and I never look back. Yet, I’m going to try, for once, to finish something. Even if I get to the end and the things I do are a bit small, or a bit dull, I’m going to finish it, just because part of being a grown up is learning to push yourself a bit, I think and let’s face it, if my last eight things could all potentially be ‘cakes-I’ve-never-eaten-before’, it’s hardly going to be uncomfortable, is it? One of the reasons I’m going to try to finish, is because I’ve been re-reading one of the best books I’ve EVER read, ‘What do I do When I Want To Do Everything?’ by Barbara Sher. In one of the chapters, entitled ‘I Never Finish Anything’, Sher says that it is important to know how to finish a project, even if you feel like walking away, because one day you’ll have a project you want to finish (and I don’t mean at work, where I have no choice!) and you’ll need the tools to help you do that. So, this is my attempt to learn. 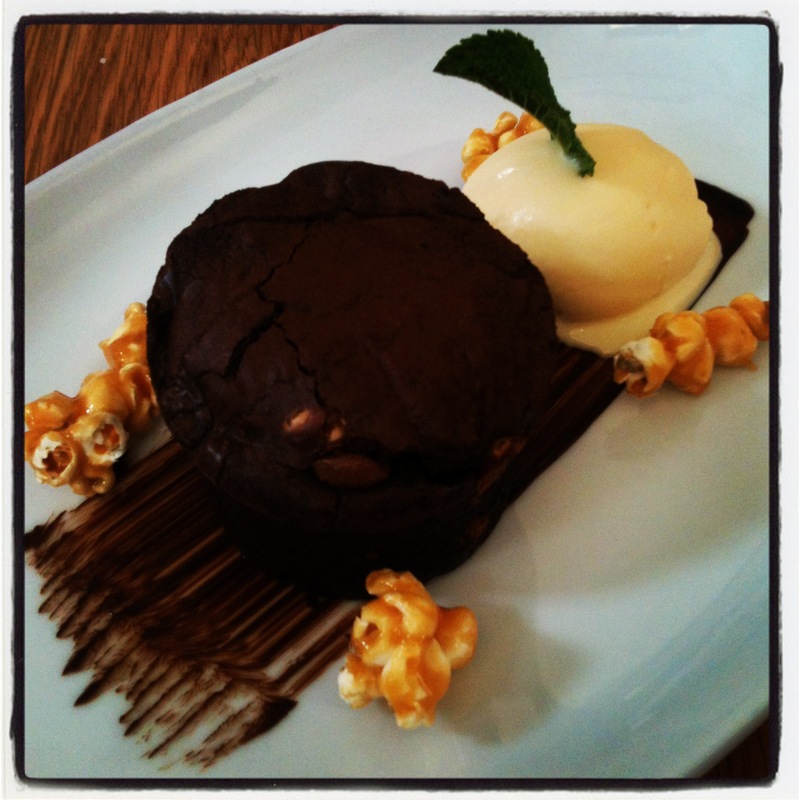 This is a cake I ate for the first time last week – triple chocolate brownie with salted caramel ice cream and popcorn, from Create. It was very special. PS: My birthday is on 6th June, which I recently found out is the same day as Captain Scott’s birthday. This pleases me enormously. Please send cake. I know what you mean about wanting to finish the Challenge, because the Challenge is all about trying NEW things, rather than anything in itself, if you see what I mean.